Ideally, you would catch the culprit who’s peeing on your carpet right away in order to have the most success in not only stopping them, but being able to clean urine stains from carpet right away! Dishwashing or fine fabric detergent, white terry towels, white vinegar, cool water, measuring cup. Mix 1/2 tsp. of dish washing soap or fine fabric detergent into 1 (8 oz. )cup of cool water. In a small, inconspicuous area, apply a small amount of the cleaning mixture to test that it doesn’t damage or react with the carpet fibers. 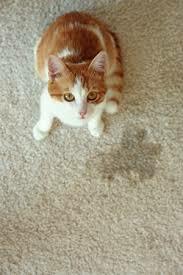 If there is no damage or reaction, blot or tamp and repeat on the urine spot until the stain is removed. Be patient. Complete removal may require repeating the same step several times. Tamp down on the carpet, do not scrub as this may distort the texture of the pile. Once the stain is completely removed, rinse the area with cold water; blot with a dry white terry towel until all moisture is removed. Repeat this process several times to remove cleaning solution residue. If residue is left on the carpet, it can attract dirt and soils. If the spot or stain turns brownish when dry, mix 1 part white vinegar and two parts water. Apply a test spot on a small, inconspicuous area of carpet to check for reaction or damage first. If the test spot is fine, then apply a small amount to the stain and blot. Repeat only once. Never use a stronger concentration than is recommended. Never use laundry detergent or automatic dish washing detergents because they may destroy or dye some fibers. First and most important step is to fix the source of the stain. A quick tips is to dab or spray the stain with straight bleach, be sure to to drip on any other surfaces to prevent bleach damage. Use safely glasses and gloves etc. I have used this quick method with good success on smaller stains. Before you remove the stain, you will have to repair what is causing the stain. In most cases, the cause is a water leak or the collection of water on your roof. Place a plastic sheet below the stained area. Using a stepladder, clean the stained area with a damp rag. If you find any mold, use bleach and water to remove it. If the stain is small, simply dab some bleach (mixed with water) on the area till stain disappears. If the stain is large, use a pigmented stain blocker (such as Kilz or Bullseye) to cover the stain. To apply the stain blocker, use rollers for smooth surfaces and brushes for corners. Allow the ceiling to dry for at least 24 hours. Once the pigmented stain blocker has dried, simply apply matching ceiling paint over the area. Let it dry and repeat this process, if needed. How do I clean and make a hardwood floor glossy without refinishing? You can use a few different off the shelf products which both clean and add polish to the floor. 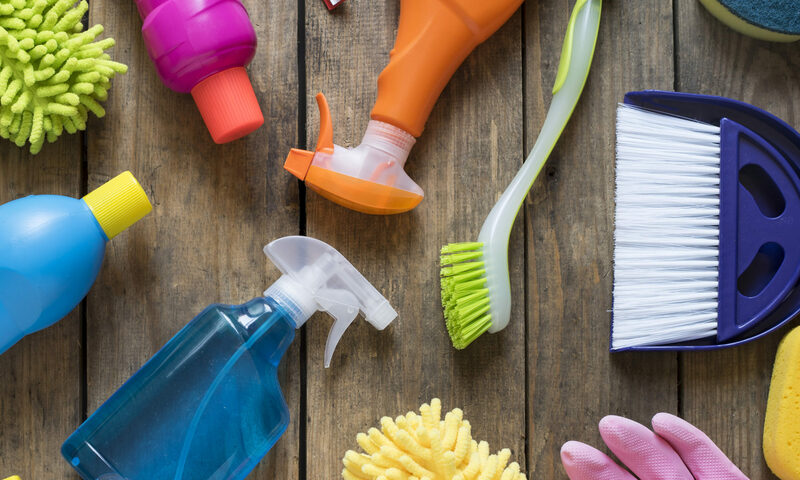 You should be sure that you have really swept or vacuumed the floor well before using these products. Since they have solids in them (wax) and dust will affect the apperance. You could also use a wood soap such as a Murphy’s Oil soap which will leave a bit of a sheen after cleaning. However the shine will not last with the above methods and you will have to constantly reapply them. If you have hardwood that is very worn you may have to apply the cleaner/polish product a few times to get the shine up as the wood absorbs the wax. Use a hardwood floor mop and a spray bottle to apply the cleaner/polish. Spray only an area that you can effectively clean. A hardwood floor mop looks like a dust mop only the fibers are shorter with a large surface area for polishing and cleaning. If you don’t have a mop use something like a beach towel which will do an effective job of polishing, but is hard on the knees. Yellowing – Always read and follow the care instructins and any warnings on the garment label. And, follow the General Rules for stain removal. Some fabrics which are white or pastel colored contain optical brighteners or fluorescent whitening agents (FWAs) which were applied during manufacturing. These agents can decompose when exposed to light and atmospheric conditions, or prolonged storage conditions. In some cases the entire fabric becomes dingy or develops a yellow cast. In other cases the yellowing develops only where exposed to light. The FWAs can also be damaged by the use of chlorine bleach. Unfortunately, once the FWAs are damaged, the whitening agents can’t be reapplied to the fabric. All fabric bleach or the use of speciality products available in grocery or drug stores, such as Rit’s “Whitener and Brightener” may help. Carefully read and follow the instructions on the product label, and check for colorfastness first. Dinginess, Yellowing, Graying – Always read anbd foolow the care instruction and any warnings on the garment label. And, follow the General Rules for stain removal. Wash with a permanent press cycle in hot water, use a cool-down rinse on permanent press and use one cup of water conditioner instead of detergent. If the fabric is white, consider speciality products available in grocery or drug stores, such as Rit’s “Whitener and Brightener” to whiten the fabric.Always separate and wash your whites separate from colors. And, don’t put heavily soil garments with lightly soiled items.